Asha Jitendra holds the Graduate School of Education's Peloy Chair in Learning Disabilities. A professor in UC Riverside’s Graduate School of Education is the recipient of two peer-nominated awards from the Council for Exceptional Children. Asha Jitendra, who joined the education school in 2018 and holds its Peloy Chair in Learning Disabilities, was presented with both the council’s Special Education Research Award and its Division for Learning Disabilities’ Jeannette Fleischner Career Leadership Award during an annual convention held in Indianapolis from Jan. 29 to Feb. 2. “I’m thrilled and humbled to receive these awards,” Jitendra said, crediting her daughter, who has a developmental disability, as the driving force behind her research career. Since earning her master’s degree in education from Purdue University, Jitendra has focused on two key research areas: instructional design and the development of interventions to help elementary and middle-school students better grasp mathematics and reading concepts. In particular, she’s worked in both special education and general education classrooms to analyze instructional materials — including textbooks — and to introduce new techniques for solving word problems and building proportional reasoning skills. Jitendra’s schema-based instructional approach to teaching mathematics focuses on the underlying mathematical structure of problems. It also incorporates visual diagrams to show how quantities in a problem are related, focuses on problem solving procedures grounded in reasoning, and highlights metacognitive strategy knowledge to monitor and reflect on the problem-solving process. 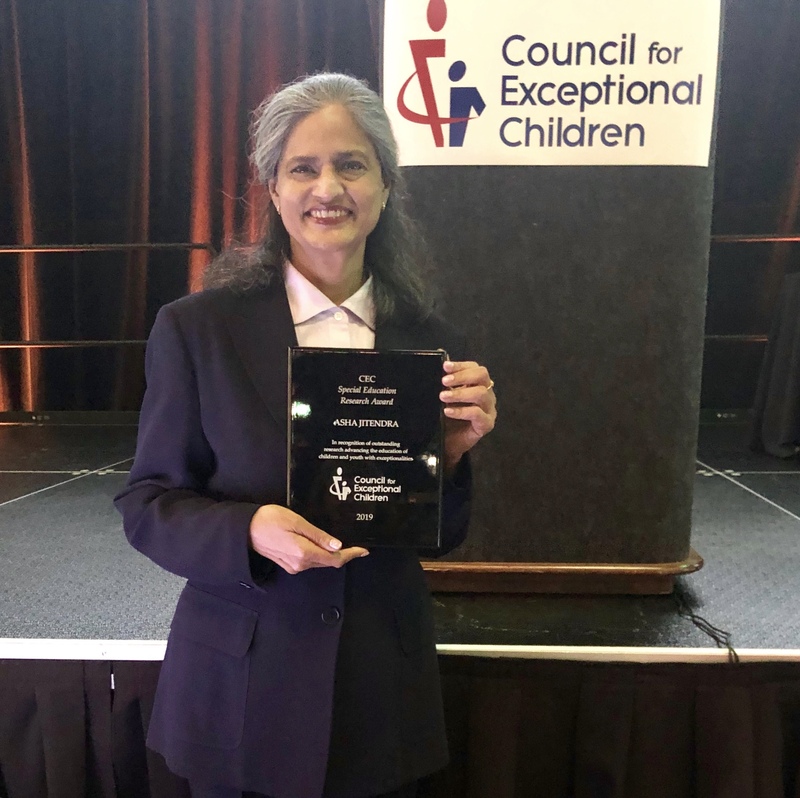 Asha Jitendra receives the Special Education Research Award from the Council for Exceptional Children. Jitendra earned her doctoral degree from the University of Oregon. Prior to arriving at UCR, she was part of the faculties at Lehigh University and the University of Minnesota. She has released more than 100 scholarly publications as well as research-based mathematics curricula, and served as associate editor of the Journal of Learning Disabilities. The Council for Exceptional Children is a professional association of educators dedicated to advancing the success of children with exceptionalities. Its Special Education Research Award recognizes an individual or team whose research has made significant, documented contributions to the education of children and youth with exceptionalities. Awarded through the council’s Division for Learning Disabilities, the Jeannette Fleischner Career Leadership Award honors individuals who have advanced the field of learning disabilities through direct services, policy development, community service, research, or organizational leadership throughout their career. This article was originally published in InsideUCR.